After writing about delicious Goan shrimp the other day, I decided it was high time I defrosted the shrimp I was saving in the freezer. I had gone to the farmers' market the day after I got back from India, with shrimp as a high priority on my grocery list. It was the wrong time of year to get shrimp caught off the Pacific coast, so instead, the shrimp available was caught off the coast Texas. Which was fine with me. It was still fresher and more beautifully ocean-scented than anything farmed in Thailand (which is where most frozen shrimp available in the States comes from — plus the farming practices are destroying the ecosystems there). Before deciding to defrost my ziptop bag of shrimp, I had actually been craving Chinese take-out. Once I determined that I ought to spend my hard-earned money on groceries instead of grease, I decided to make two of my favorite Vietnamese shrimp dishes: cabbage and shrimp soup, and shrimp simmered in a caramel sauce. I've posted about the soup before, though this time for the broth, I used half water and half chicken broth (which was about to go bad). It was fine, though it didn't do any favors for the cabbage-shrimp flavor that makes this soup so good. It also smelled a little funny, but I realized that the intermingling scents of the shrimp and the cabbage were just playing off each other in an odd way. I happily ate it up despite that. The other dish is one of my all-time favorite shrimp recipes — other than this one, of course. The very first time I ever made shrimp in caramel sauce, it was so good that I couldn't put my chopsticks down. Besides being delicious, it's ridiculously easy to make, once you've got the caramel sauce prepared. The recipe for caramel sauce makes quite a bit, and it's shelf-stable, so it keeps practically forever in a jar with a tight-fitting lid. Truth be told, I haven't eaten a whole lot of Vietnamese food. When I was in grad school, there was a great Vietnamese restaurant around the corner, where I would order the "clay pot" (which contained chicken, shrimp, onions, and green beans in an amazing slightly sweet sauce, all over rice) and a Vietnamese coffee (which kept me awake and jittery for the rest of the day). I've also had the charcuterie that a Vietnamese friend brought to a dinner party — the soft pâté-like spread on slices of baguette was completely addictive. I guess my point is that when I make things from my Vietnamese cookbook, I don't have many taste experiences I can compare it to. Which isn't a problem, really. More of an observation. I also want to add a small note here: Do not fear fish sauce. Fish sauce, the dark brown, salty, and yes, fishy condiment used in southeast Asia and the Philippines, adds a unique flavor that you can't get from adding, say, salt. It appears in both the soup and the caramel shrimp recipe. When I add to the pan while cooking, the fragrant smell of fermented fish always puts a smile on my face — because I've learned to appreciate what this sauce brings to the food I eat. Like salt, only a small amount is ever used to season any dish, so I'm not asking you to drown your meal in fish sauce. But do give fish sauce a chance. You'll be glad you did. In a shallow pan, combine shrimp, fish sauce, caramel sauce, and 1/8 tsp salt and bring to a simmer over high heat. Add the onion and pepper and stir to distribute ingredients evenly. Continue cooking over high heat for another 10 to 14 minutes, or until the shrimp have turned an orange-brown. Turn off the heat, add the oil, and stir to coat. Add pepper to taste. Transfer to a serving bowl and sprinkle with chopped green onion. Fill a large bowl with water so that it comes partway up the side of a small, heavy saucepan. In the saucepan, put 1/4 c water and all the sugar and place over medium-low heat. Stir to ensure the sugar dissolves. After about 2 minutes, stop stirring and let the mixture cook undisturbed. About 7 minutes into cooking, bubbles with cover the entire surface and the mixture will be at a vigorous simmer. After about 15 minutes, the sugar will begin to caramelize and deepen in color. When smoke starts rising, around 20 minutes, remove the pan from the heat and slowly swirl it. The sauce will turn darker. 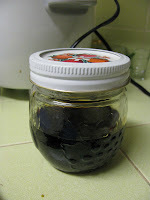 When it is the color of black coffee or molasses, put the put into the bowl of water to stop the cooking. Add the remaining 1/2 cup water. After the dramatic bubble reaction ceases, return the pan to the stove over medium heat. Heat the caramel, stirring until it dissolves into the water. Remove from heat and let cool for 10 minutes before puring into a small heatproof glass jar. Set aside to cool completely. Cover and store indefinitely in your kitchen cupboard.